Win River is our newest construction project. Enjoy high end luxury including keyless entry doors, garages, and sleek modern decor. Easy access to Tulsa Hills shopping, the new Margaritaville with it's fantastic restaurant choices and the Riverparks. Designed for luxurious living, this boutique community offers unique features you will find nowhere else in Tulsa. Let us show you a new concept in apartment living. Hidden beauty can be found inside the gates with a meandering creek running through the property. Don't miss a chance to see this one! Skip the Stairs and Take the Elevator! A1 One Bedroom Apartment at Crown Win River Apartments in Tulsa Oklahoma. A2 One Bedroom Apartment at Crown Win River Apartments in Tulsa Oklahoma. V1 One Bedroom Downstairs Villa Townhouse at Crown Win River Apartments. Click for Prices & Availability. V1 Upstairs One Bedroom Villa Townhouse at Crown Win River Apartments. The floorplan for the B1 Two Bedroom Two Bath at Crown Win River Apartments in Tulsa Oklahoma. The floorplan for the B2 Two Bedroom Two Bath at Crown Win River Apartments in Tulsa Oklahoma. Bathroom at Crown Win River Apartments in Tulsa Oklahoma. FRESH & NEW ! 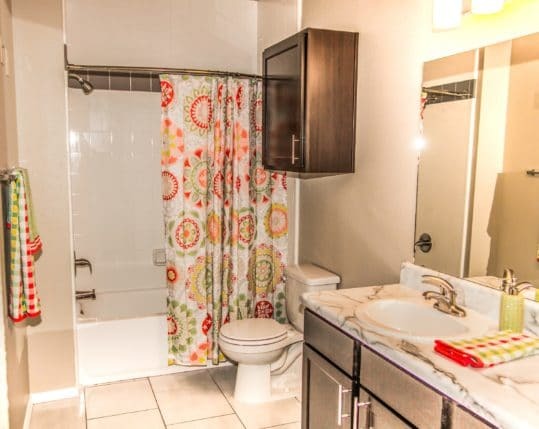 Come Tour this One Bedroom Home! BRAND NEW AND STYLISH! That's what you will say when you see this roomy 1 bedroom apartment home. It offers an open concept floorplan with a kitchen island, modern pendant lighting, silver appliances, hardwood style flooring and EXTRA tall ceilings. Check out the super large closets and spacious master bedroom with ensuite bath. Enjoy your morning coffee or evening libation out on the patio or deck. You don't want to miss out on this. I got an advance tour with Terra. She was absolutely fantastic. I jumped at the chance to reserve a penthouse apartment at construction prices! A boutique apartment community with sleek modern designs. Grow your own veggies or flowers in our fully equipped community garden. The air is better here!